Bill Grun was 98 years young. That phrase, “years young,” gets thrown around sometimes when people try to express just how energetic and active someone is at an older age. But in Bill’s case, the terminology is a perfect fit. You see, Bill was a fixture at Synod School for many, many, many years. He would later work as a construction worker for a day in April of 2018 in celebration of his 98th birthday. A year earlier for his 97th birthday, he rode in a Doylestown Fire Company fire truck and, of course, sounded the siren. At age 96, he made it a goal to complete a bicycle ride of 9.6 miles. Bill passed away on Monday, March 25, one month shy of his 99th birthday. He was still active at Doylestown Presbyterian Church where he worked with the youth there. He had been employed as a teacher in Doylestown, PA, leading technology and mechanical drawing classes for the last 27 years after originally retiring in 1980 after 34 years of teaching. He was also still a regular volunteer at Kirkwood Camp & Retreat Center in Stroudsburg, PA.
John first became acquainted with Bill at Princeton Theological Seminary where John studied alongside Bill’s daughter, Margaret (Grun) Kibben. Aside from Margaret, Bill is survived by another daughter, Marylou Elizabeth (Grun) Tangye. Margaret is a retired Chief of Chaplains for the United States Navy Chaplain Corps – the first woman to ever hold that position. Bill was preceded in death by his wife, Jean, who was better known as “Micki.” She passed away in 2009. 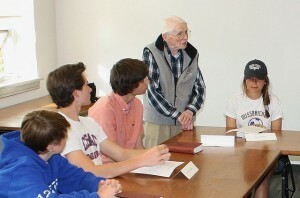 Despite a large age difference, Bill Grun always had his students’ attention while leading a youth class at Doylestown Presbyterian Church. John described Bill as a “passionate mission trip person.” He recalled Bill joining the Doylestown Church on a work trip to Mississippi following Hurricane Katrina. That means Bill made the trip while he was in his mid-80s. While Bill wasn’t able to be as hands-on as he would have liked, he did spot a flaw in a roof design and was quick to have changes made. At Kirkwood Camp, he was known as “Birdhouse” Bill (although he was known to correct you by saying he’s “Bill who builds birdhouses”). Bill was cherished by the camp that is associated with the Philadelphia and Lehigh presbyteries. 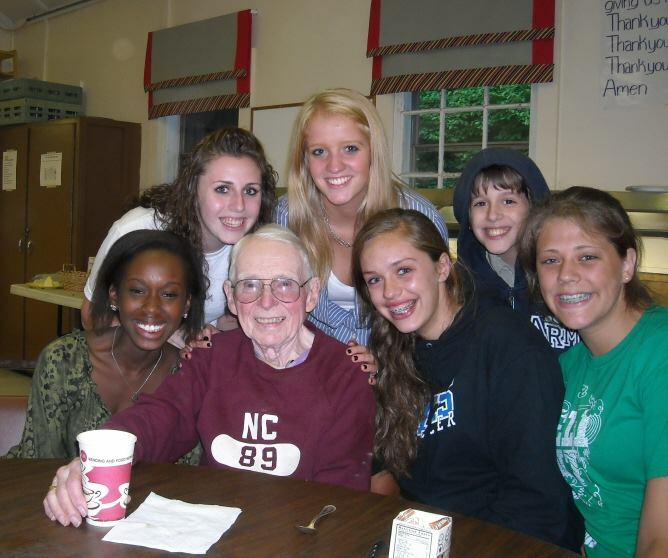 “Bill was, by far, our longest tenured volunteer here at Kirkwood, and more than a few times over the years put our ministry on his back to make sure that summer camp would happen,” wrote Tommy Campbell, the director of Kirkwood Camp, on the camp’s Facebook page. “Bill most recently was known around camp for teaching woodworking every summer during our Joy of Creation Camp but was also a lifelong educator in and out of the church. A WWII veteran, many of us knew Bill for his indomitable will and determination in all phases of his life, but especially later in life as he refused to slow down. Bill was known around the Doylestown area for riding his bicycle. It’s also a memory Mary Speedy from the Presbytery of Carlisle will have of Bill during the days of Synod School. 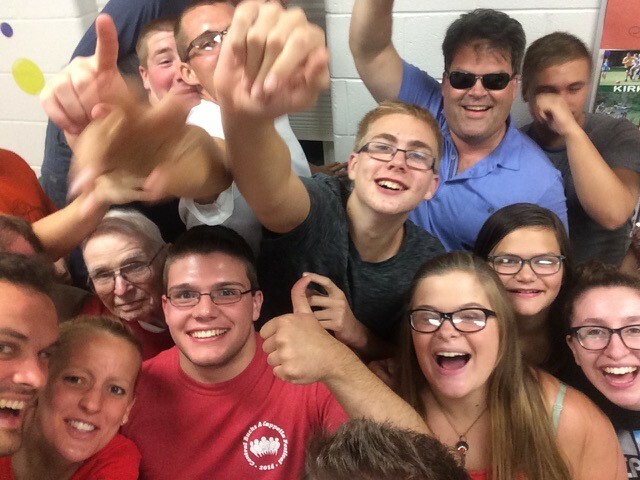 Bill Grun (center-left) was always in the middle of the fun with the youth at Doylestown Church. Aside from Synod School, Bill also worked with the Synod’s Intensive Teacher Training program for many years, serving both on the committee and helping teach. As Bill reached his late 90s, he received widespread recognition for his exploits from the local media. Philadelphia television station KYW-3 interviewed him about his lengthy teaching career and he wrapped up the discussion with advice he learned from one of his own teachers. They’re words Bill certainly lived by. The Synod of the Trinity is thankful for Bill’s work and service to the region and sends condolences to his family and friends. 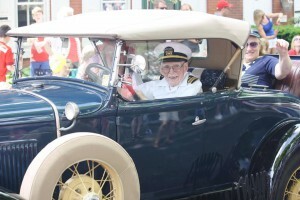 Bill Grun drives in the Doylestown Memorial Day Parade in 2016.